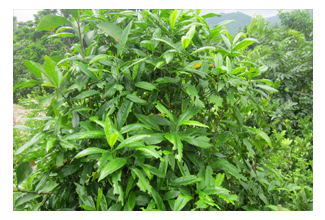 As per a small survey and inspection by the scientists of the R & D Division of Biotechayur Pvt. 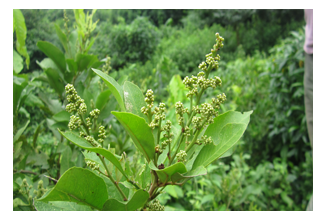 Ltd., many rare and potentially high value medicinal herbs used to flourish in their natural habitat spontaneously inside the Panchalingeswar Hill areas and localities. 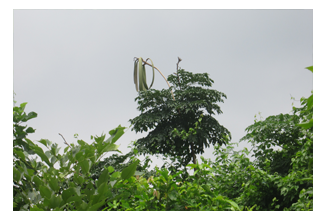 Atop the hill and valleys, many rare medicinal plants can be seen,such as Strychnus Nuxvomica (Visha tinduka),Bombax malbaricum (Shimili cotton/tula), Bombax ceiba(Shimuli), Cassia angustifolia,Cassia fistula, Cassia alata,Boswellia serrata(Shallaki), Gloriosa superba (Laha langalia), Cissalpinia crista(Lata karanja),Adhatoda vasica (Basanga), Premna integrefolia(Agnimantha),Tephrosia purpurea (Sharpunkha), Caesalpinia pulcherrima (krushnachuda),Abrus precatorius(Gunja), Shorea robusta(shal tree),Dalbergia sissoo(shisu),Asparagus racemosus (Shatavari),Curculigo orchioides(Talmuli), etc., and various other species of plants. 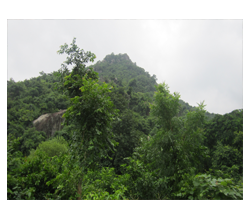 Currently, this place is under the protection of the Forest Conservation Department, Odisha. The vast wide valley is surrounded by hills, trees, creepers, and thorny bushes. Standing in the midst of the valley, you can see the blue sky above, the hills and the green forests, and black shiny stones glittering like diamonds. A paradise on earth indeed! This place harbors a wide range of biodiversity. 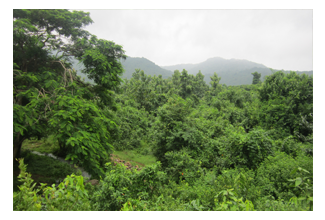 Elephants are also often can be seen roaming in this valley.Species of rare snakes,including the king cobra, large pythons, boa constrictors,and common kraits, etc., can be seen in these jungles. Other animals,like hares, rabbits, hedgehogs, boars, bears, cheetah, wolves, monkeys are very common in this region. Also seen in the forest are a variety of birds, such as peacocks, peahens, wild pigeons, cuckoos, parrots, and wild fowls. During the autumn and spring seasons, the valley becomes alive with a canvas of various colors as different species of flowers blossom. Many eminent poets of Odisha, including Kavivara Radhanath Roy,Kaviraj Jadunath Satapathy, Poet Pradipta Kumar Panda, Biswanath Das all have described this serene place in their books. They have tried to describe this place as much as possible in grandiloquent words and poetic description. As the place is a popular tourist destination, day by day urbanization of this locality is harming the local flora and fauna of this place and causing much damage to the biodiversity.Littering this serene place with polythene bags and soda cans runs rampant in this area. Due to mass gatherings of people for religious activities, like Bolbom, people are littering this place and contributing to the damage this pollution-free environment.To protect the biodiversity and natural panacea of this place, the government authority and the cooperation of local people need to have incessant arduous efforts, to save this huge natural treasure trove from being on the verge of extinction.